I remember the first time I made this recipe well. The day was unremarkable, nothing special happened, but for some reason that moment and that morning sticks out in my memory. Marcus and I were in Canmore, enjoying the condo my parent’s had before their current house there. I don’t think we had Pip yet – life without Pip? Strange. It was cold that morning, and I remember doing my scone thing while Marcus was lying on the floor in front of the TV, with his head propped up against a chair. The kitchen sort of overlooked the family room area from a distance, so I could see Marcus and the TV and do the baking business all at the same time. He was watching House Hunters International, and the episode was based in Paris. Scones were baked, Paris was on the TV, mountains in the background…it just sticks out! I also remember that morning because Marcus completely loved these scones. He thinks they are the best thing, ever. Marcus would pay $8 for one of these babies! I certainly like them, but not like he does. And while I’ve made scones in the past, these got me in a kind of scone groove that I’ve quite liked. I’m usually not the biggest chocolate-fruit-combo fan (I’m more of an apple-cheddar kind of gal), but Marcus will always, always go back to these. You’ll be shocked to hear my Dad used to make scones for us when I was a kid. Muffins, scones; it was a regular thing to just wake up and have something delicious and freshly baked out of the oven. My Dad makes great scones, like blueberry or oat-raisin. I don’t think we ever had something chocolatey in a scone (although there was a hotdog-pancake situation once), so these were the perfect balance of different and familiar for me to give them a try. I’ve made this recipe more times than I can count. Deb’s original recipe has you use a stand mixer to first mix the dry ingredients and then bring in the wet ingredients to form a dough. I prefer to not use a mixer; I don’t think you need it and it saves the extra dish cleaning. Your hands are wonderful tools for scone making. They will no doubt get a bit doughy, but I find it the best to bring everything together, pat it into a ball, and then form the disc. You can certainly use a mixer to do that dirty work if you prefer. 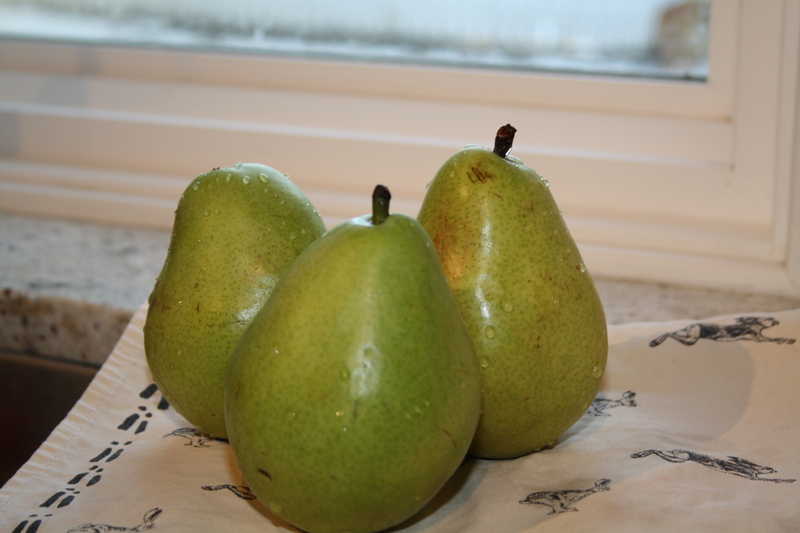 If you only have (or can only find) ripe pears, don’t fret. They’ll simply need longer in the oven to give them a good drying-out. They’ll also, of course, excrete more juices than their under-ripe friends. Important: you definitely want to wait until the pears are dry to the touch. 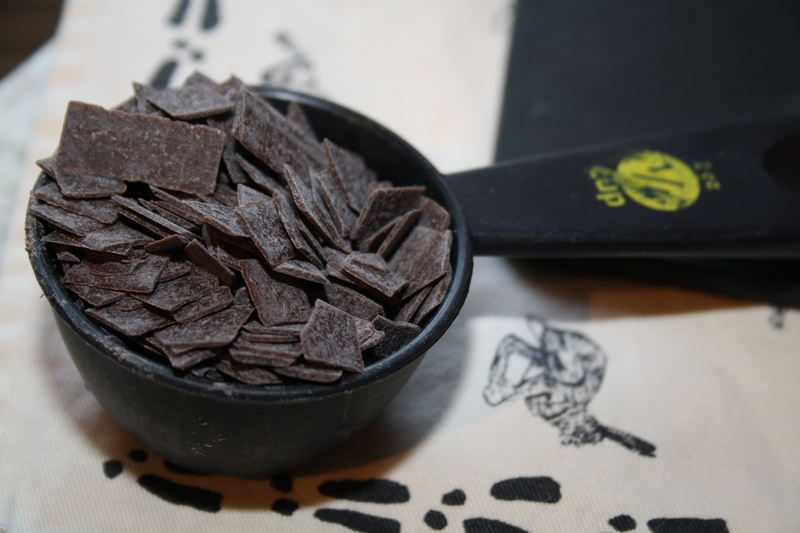 Their flavour concentrates, and there isn’t any added moisture to worry about in the dough. The result is flaky, flaky pastry that’s tender and delicious. 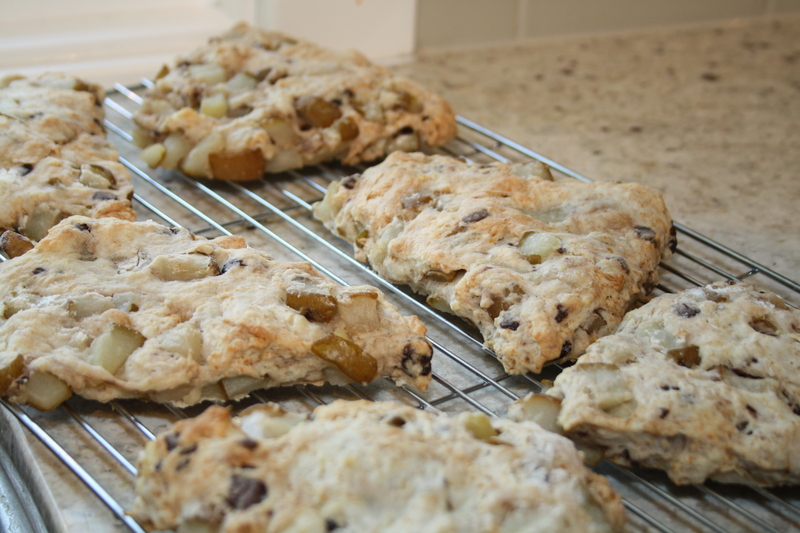 These scones aren’t too sweet, and you could easily omit the chocolate or swap the pears for a different fruit, say apples. 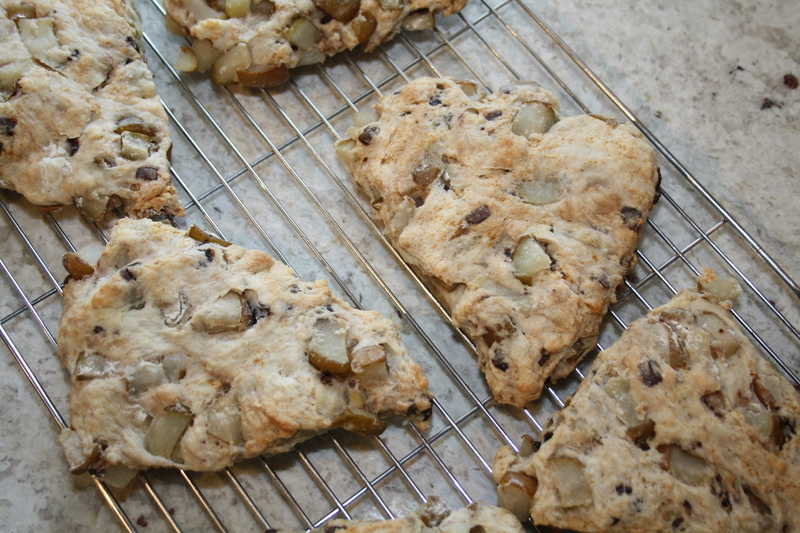 Or omit the fruit and keep the chocolate (chocolate scones? ), although you’ll be hard-pressed to pass it off as breakfast. I’ve saved the most wonderful thing about these scones, really any scones, for last. You can make the scones until the point of baking, and then pop them in the freezer instead of the oven. The unbaked scones freeze beautifully, and then you have an easy, decadent breakfast treat to throw in the oven when you wake up. Bake the scones from frozen, and add a few more minutes of baking time. I, in fact, have a tray of unbaked scones in my freezer right now, waiting for a friend of ours who is visiting for a few days. And while he’s had these before, as I like to serve them for guests, I know they’ll be so enjoyed on a weekday morning before we all dash off to work. If Marcus doesn’t eat them all first. Dice pears into 1 inch pieces. On a parchment-lined baking sheet, roast pears until their slightly browned and feel dry to the touch, about 20 minutes. Let the pears cool to room temperature. In a large bowl, stir together the flour, baking powder, sugar and salt. 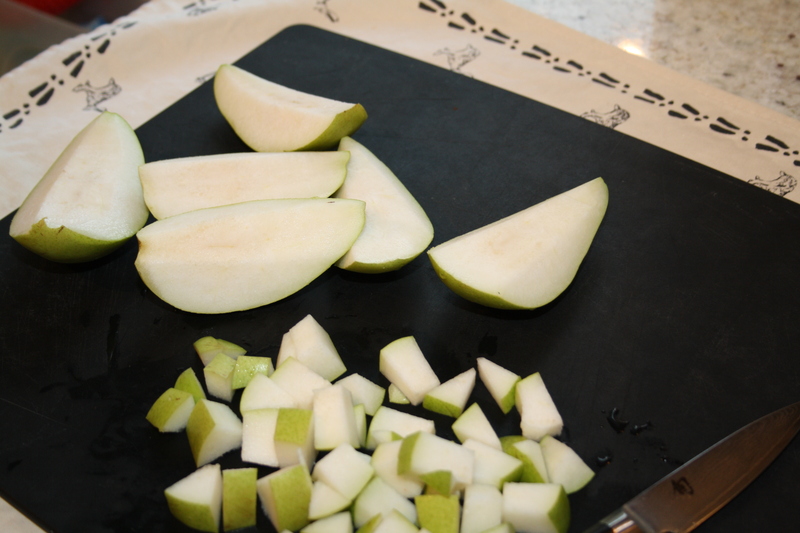 Stir in the cooled pear, cubes of butter, 1/4 cup heavy cream, and egg, and mix until it at all comes together. I use my hands for this, and while messy I find it easiest. If the dough is too dry and won’t come together, add the remaining heavy cream a little at a time. Don’t overmix the dough, and at the last moment add the chocolate chunks and work together into a sort of ball. Flour your countertop or other hard surface, and press the ball of dough with your hands until it looks like a disc. The disc should be about 2 inches thick. 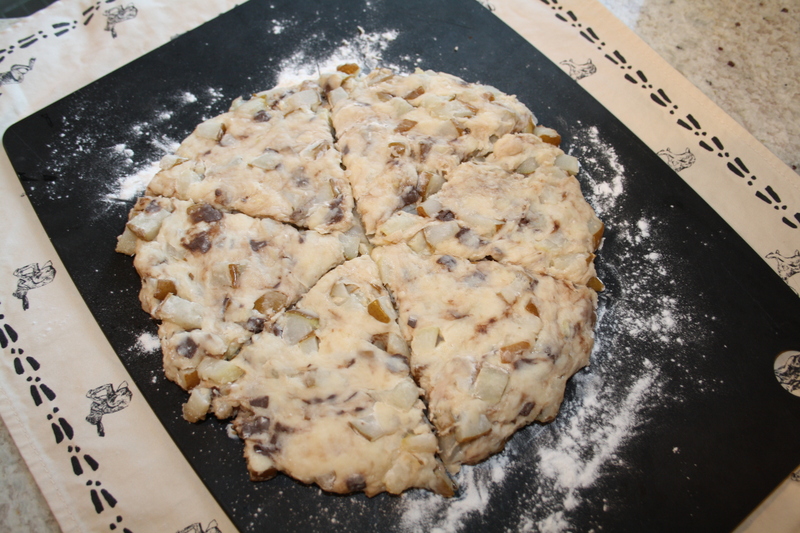 Cut the disc into 6 wedges, and transfer to a freshly parchment-lined baking tray, at least 2 inches apart. Bake scones until golden and firm to the touch, about 30 minutes. Let cool on a rack and serve warm.